Ron Webb began playing mandolin at the age of 12 after his dad purchased one so he himself could learn to play. His grandmother, Cora Jane, taught Ron his first song and his dad taught him two things that Ron says are still most important for playing bluegrass: playing the melody of a song and learning to play all of the scales. Ron played with his dad’s band through his teen years and went on to play in the Hazel River Band, the Darren Beachley Band, and many others. In 2008, his superb mandolin skills were recognized and he was bestowed the honor of Maryland State Mandolin Champion. Ron touts his musical influences as his Dad, John Duffey, Tony Rice, The Beatles, Jerry Douglas, and any mandolin player he has ever heard. 2012 marks Ron’s 30th year of playing mandolin. 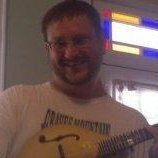 In addition to Rattlesnake Hill, Ron plays mandolin and sings lead and harmony vocals for Circa Blue; Ron is also an accomplished songwriter and guitar player.